Something I get asked about quite a lot is how I come up with new recipes. I don’t have any formal training as a cook or recipe developer; everything I know I have learnt from trial and error, books and my Mother. Yes, I’ve been lucky enough with my job as both a blogger and a freelance food writer that I’ve been into the kitchens with some great chefs that I have learnt a fair bit from; I’ve been taught professional knife skills for example, how to joint a chicken and how to fillet various fish, but only in crash courses. 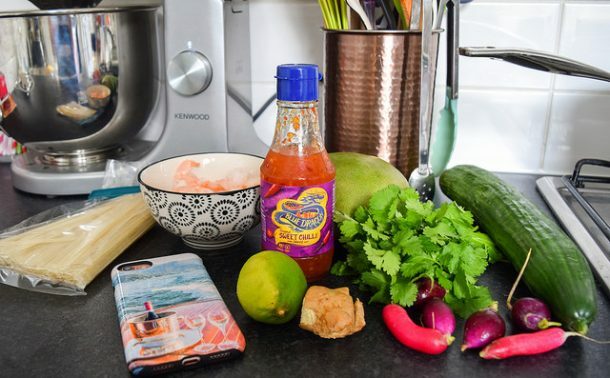 Today I thought I’d share with you some of the processes I go to when writing completely from scratch recipes, some of which appear here on my blog, but mostly appear as commissions elsewhere around the internet for my various columns and guest spots. I do post some recipes here on the blog that are not originals, but unless I’m reviewing a cookbook, these recipes are things I’ve tried from other people that I think are too fantastic not to share, but I’ve made my own little tweaks to. When I have to come up with something new, unless I already have inspiration or I’m working from from another source or a brief I’ve been given, I hit the books. At home I’m lucky enough to have access to two great cookbook and food magazine back issue collections; my Mothers which is very much geared towards French food and the history of food all over the world, and mine which is full of modern classics. We both have a fair few ‘core’ books between us too such as my beloved Leith’s How To Cook which have good basic recipes and techniques in them, which I can then build on by adding different flavours as needed. Aside from finding core recipes to work from where I don’t already have my own (we’re talking things like a plain cake batter, or the right cooking temperature and times to roast a chicken here), hitting the books is also great for brainstorming. Say I’m looking for different ways with an avocado, seeing how other people have used it as an ingredient helps jog things in my memory and imagination. While we’re on the topic of books, one book that I’ve found invaluable in recipe development (a reader recommended it to me on Twitter but I can’t remember who, if that was you please give me a shout!) that I must give a shout out to is The Flavour Thesaurus by Niki Segnit. 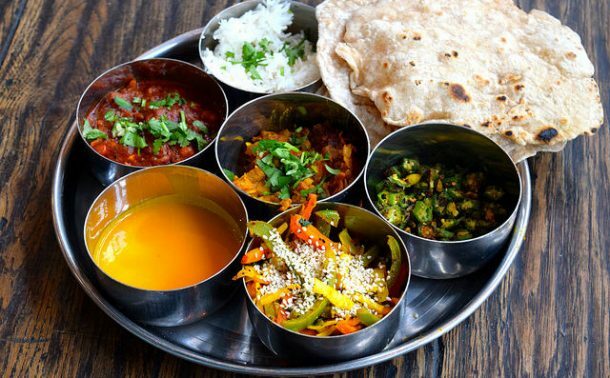 While there are some recipes in the book, it is essentially a book of flavour pairings; look something up, and it will tell you what tastes and flavours perfectly compliment it. As you can imagine, when I’m working up ideas as hypotheticals to pitch them to editors without necessarily having tried something first, it is a life saver. While nothing for me will ever replace the feel of a glossy cookbook in my hands and on my kitchen counter, I do turn to other bloggers fantastic sites for inspiration, too. (You can see some of the blogs I turn to for inspiration here.) I gather all the posts together that I want to cook from or keep for inspiration using the Evernote Food app on my iPad, which collates together all of the items from the ‘recipes’ folder in my Evernote account. I save recipes and photos from blogs to this using a bookmarklet for my web browser, and it all syncs together pretty seamlessly. 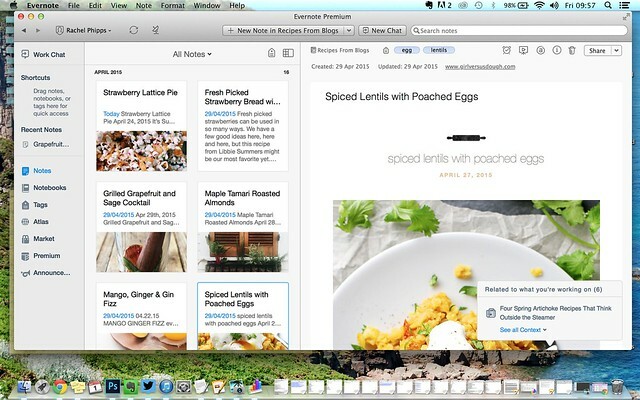 When I save recipes, I make sure I tag the clipping with all of the primary ingredients in the recipe, so when I’m searching for inspiration I can specifically search per ingredient within the app or my Evernote desktop on my Macbook. You can get Evernote for free to save up to 100 recipes, but after that I pay a pretty reasonable subscription every year that I would not be able to do without. Moving more into the digital realm, Pinterest plays a big part in my recipe development, in two different ways. First, I use my own public boards as inspiration. For example, when I was brainstorming ideas for my Fresh Strawberry Buttercream and Pistachio Mini Cakes, I’d come up with the flavour pairing that I wanted to use, and I knew that I wanted to make some form of mini cake. However, I had no idea how I wanted the final product to look. By running through my ‘Cakes & Cookies‘ board, looking at pictures of other peoples cakes I’d pinned, I came up with a few ideas of what I could do, which helped me narrow down on the final method and recipe. 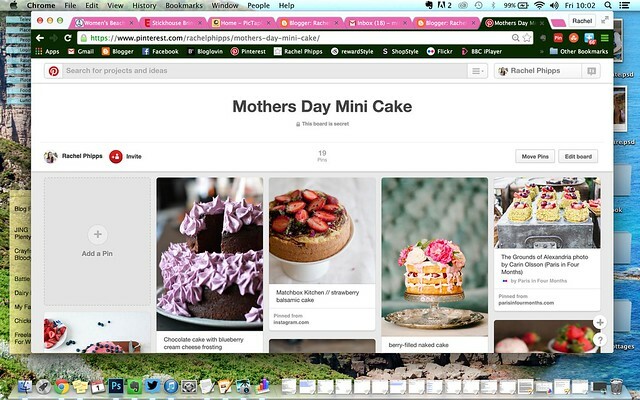 The second way I use Pinterest in my recipe development process really feeds off of the first: secret boards. When I wanted to gather the images and ideas I liked for those cakes together, I pinned them to a secret board. At any given time, I have about three or four boards going for recipe related projects I’m working on. These are usually for bigger projects and brand collaborations. 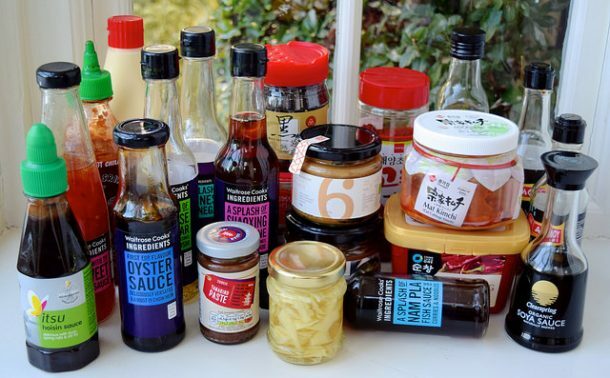 While as with probably every recipe developer I do take inspiration from things I’ve eaten in restaurants, I actually get a fair few ideas from the supermarket. All of the ready meals that I’m not actually going to buy are a veritable goldmine. 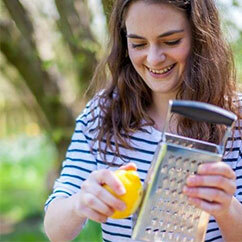 Let us take for example my Borough Market column on easy, make ahead desk lunches. To get ideas for the column, I headed to Waitrose to see what was on offer in the chiller cabinet for lunches. This is how I came up with my Vietnamese Salad Rolls and and exciting sandwich recipe which should be appearing for National Sandwich Week. I still have ideas saved for later that did not make it into the column jotted down. Also, sometimes just looking at one ingredient when you have another recipe on your mind in the store can create fabulous combinations. One of the most popular recipes on this blog are my Smoked Salmon Latkes. That is what happens when you’ve been slightly obsessed with making latkes all week, and then you start looking at different types of smoked salmon in the American grocery store. There is a similar story behind the existence of my Salted Caramel Double Chocolate Rolo Cookies. Finally, some of my recipes just come from things I’ve randomly thrown together from the fridge when I was looking for a meal last minute, and then luckily could remember what I did and to scribble the recipe down at the time. This is how my Breaded Prawns with Sweet Chilli Dipping Sauce, Simple Potato Salad, and my personal favourite, my Indian Spiced Leftover Summer Vegetable Fritters came to be. I hope, after so many of you having asked this gives you a nice bit of insight to a very large portion of what I do day to day. If any of you have any follow up questions, I’d be happy to answer them in the comments section. 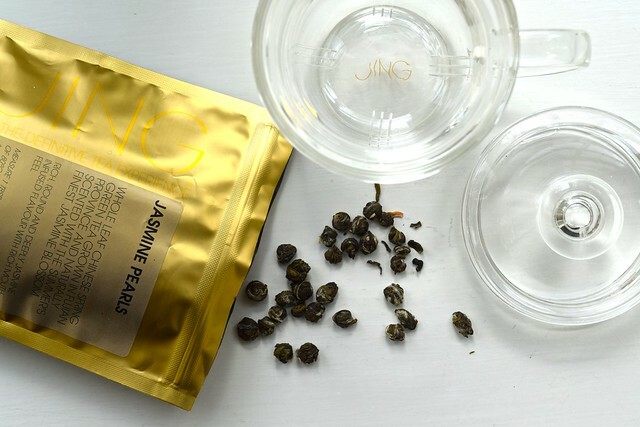 In other news, as I’ve got you here I want to say a few things about the tea from brilliant brand JING that has appeared in this post. I’ve been quietly sipping away for the past 6 months or so from this great mug infuser they gave me when I went to a tea tasting with the team in London, and I’ve been waiting for a blog post where I could drop in a few words about it. 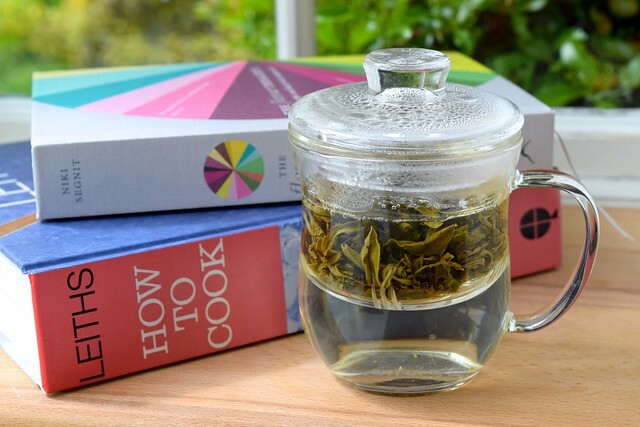 Aside from the glassware being both very pretty and practical for making loose teas at home (you can get your hands on one here), while being more in the price range of a treat of gift tea, their teas are great to relax and unwind with, as it is such a calming process to make up a cup. 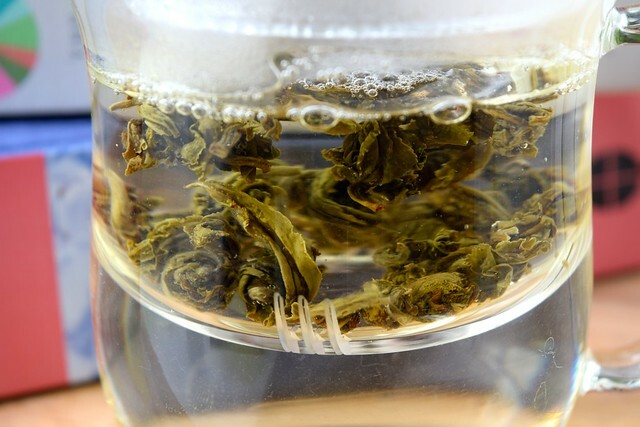 My favourites are their unbeatable peppermint tea (which you can either get loose in bulk or as a tea bag) and the beautiful jasmine pearls you can see above, which start off as tight little balls and unfurl as you add hot water; it also makes a deliciously refreshing and delicate cold brew, too. Finally, sorry I’ve been posting a bit less here on the blog and on social media over the past few weeks. I’ve been having an amazing time and working incredibly hard on the general election campaign for a fantastic candidate and with a wonderful team who I’ve had a great time working with. I’ve got a few posts planned and keyed up for between now and then, but I’ll be back to regular posting once I arrive in Los Angeles after election day, promise!